My July plans were full of various (short!) local races I wanted to compete in, but the other week in Yosemite I managed to kick a rock whilst wearing flip flops, so a very swollen big toe has put paid to all my plans. I’m finding this vexing as it’s making playing netball pretty difficult (I guess I should take some time off from that to let my toe heal, but I don’t want to miss out on the fun!) and I can’t go on my usual runs. Super annoying. Instead I’m sticking to the cross trainer, the bike and weights at the gym, no running or rock climbing for me at the moment, boo. However, for those of you who haven’t managed to temporarily cripple yourselves, there are plenty of places to enjoy a sweet run in SF, which was voted the best city in the country for runners in 2005 by Runner’s World, thanks to the scenic spots to run and the wide variety of races. 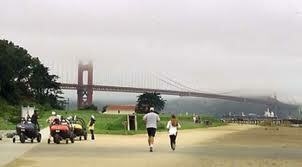 Running in San Francisco goes from the sublime…..
Running through Crissy Field, image from SF Gate. 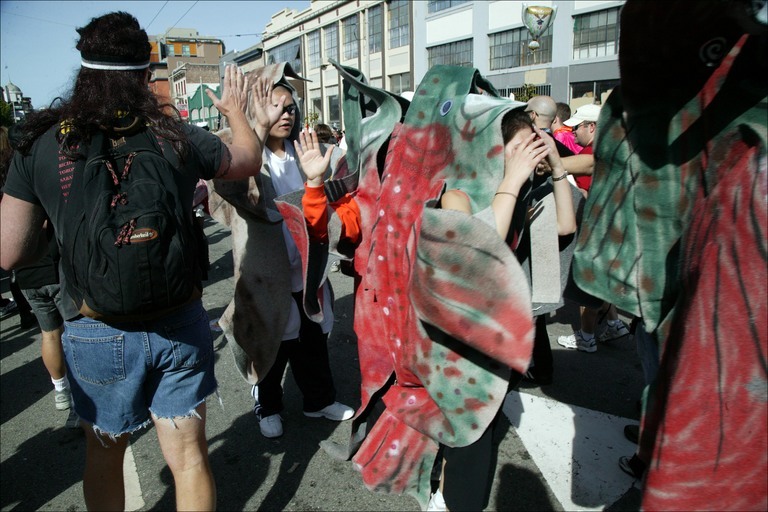 Runners dressed as salmon the the Bay to Breakers race, image from here. All sorts of crazy goings on happen at this race, including the salmon starting from the finish line (swimming ‘upstream’ against the other runners). Apparently in recent years people have dressed as bears and tackled the salmon whenever they meet. Very creative.